A guide price is the quoted figure used during the marketing period and used by potential buyers to decide if a property is of interest to them. Setting the right guide is important in attracting as many bidders as possible. It can be quoted as an open guide such as £100,000+ or as a closed guide say £90,000 – £110,000. The reserve price is an undisclosed figure agreed by the seller and the auctioneer, the property cannot be sold below the reserve during the auction. The reserve price may be set later than the guide, or just before auction day to reflect the interest levels and feedback from potential buyers. A reserve price cannot be set more than 10% above an open guide or must be set within or below a closed guide. Your solicitor will prepare an auction legal pack and contract for all potential buyers to view before auction, it contains all the important documents and information that a buyer needs to know before they buy. It is used on auction day to exchange contracts with the buyer. This is a list of any changes to the auction lots that occur between the catalogue being printed and auction day. It will list any guide price changes and lots sold prior to auction for example. Can I sell prior to auction? Yes. We often get offers prior to auction from buyers who do not want to wait for auction. Whether to sell prior or not will depend on the offer amount & other interest received prior to auction. Sell by auction will advise on what to do. What happens if my reserve is not met? If bidding on the day does not reach or exceed the reserve the auctioneer cannot sell your property. You will have the option of accepting the highest bid after the auction, if the buyer still wants it! They may have gone home, bought something else or make a reduced bid after the auction. Don’t take any chances with your reserve price. How do I get a free auction valuation? What fees are involved in selling by auction? Sell By Auction operates a no entry fee and no sale no fee auction with no upfront auction entry fees. We can even arrange for a solicitor to deal with the legal pack and sale with no upfront costs. A sale commission will be agreed and confirmed in writing at the auction appraisal, this does vary depending on the property value and your exact requirements. How soon can I sell my property by auction? Now. Sell By Auction is taking entries for auction all year long. You are never more than 2-3 weeks away from our next auction. 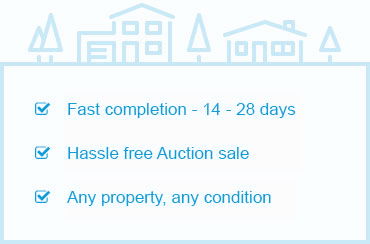 With the fastest marketing period of 7 days and shortest completion of 7 days we can sell, exchange and complete by auction in just 14 days. Although we do recommend a 14-day marketing period and 14-day completion period for maximum effect. CALL US ON 0800 302 9441 TO SPEAK DIRECTLY TO AN ADVISOR.